Global Coil Coatings Market Size is estimated to be valued over USD 4,100 million in 2018 and will register a CAGR of 4.6% to create high revenue opportunity for industry players. Coil coatings was first used in 1940s. Since then, the industry has grown manifold to create high revenue opportunity for industry players. As of 2017, the industry is substantially fragmented (45%) with presence of regional players in South East Asia. However, the industry ecosystem is organized in Europe and North America with major share captured by large scale companies. Leading players are consistently seeking higher revenue growth through consolidation. As a result, there has been mergers and acquisitions in the market in last few years. Another key trend witnessed in the market is strengthening and integration of value chain to ensure lower operational cost and higher return on investment (ROI). 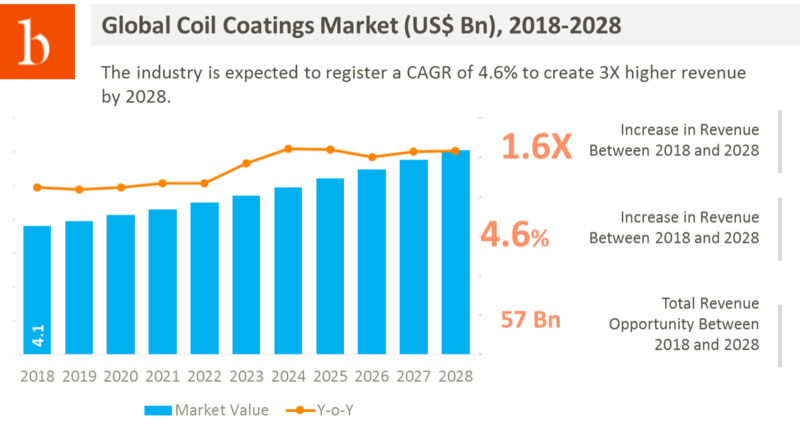 While there has been market maturity in the industry – leading to lower incremental opportunity, improving macroeconomic conditions is expected to spur the overall coil coatings market demand. Coil coatings is primarily used in building, transport and consumer goods (furniture, etc). A major portion of revenue is generated from construction sector. However, construction registered negative to staggering growth of just 0.3% in between 2012 and 2015. Signs of recovery started in the sector since 2016. As such, while demand for coil coatings will be favorable during the forecast period. Regulatory policies will also play a major role in sales of coatings. For instance, Europe REACH checks the sustainability in chemical industry. This includes few major policies including antidumping laws – that helps in ensuring high quality products in the market. In 2017, polyester coil accounted for the majority of the global share owing to its excellent anti-corrosion properties and easy availability of raw materials at competitive price. Another major product used in coil coatings are Polyvinylidine Fluorides. It accounted for 16.8% of global share in 2017. While the material is costly, it offers good aesthetic appeal and is highly durable in construction activities. As such, the demand for PVDF will continue to grow over 5.1% CAGR during the forecast period. Coil coatings primarily finds its applications in construction, automotive and consumer appliances segment. Architectural applications is one of the key application of coil coating. As such, its usage is very high in the industry. Construction sector is estimated to generate over US$ 2,800 million revenue for coil coatings manufacturers and suppliers. Other than construction, it is also gaining traction in consumer appliances. It is extensively used in electrical appliance manufacturers as it removes the need for painting process in factory and in turn enhances their operational value and improves productivity. The segment will gain significant traction during the forecast period (2018-2028). Globally, Asia Pacific will dominate the sales with over 70% of revenue generation from China, India and South East Asia. Asia Pacific accounted for 36% of global revenue in 2017 and is expected to reach 43% by 2028. Much of the gain will take place in India and South East Asia. The regions are not only registering improved GDP and GVA growth, but also registered growth in net industrial output. While China will lead the region in production and consumption of coil coatings, India will create high untapped market opportunity for industry players during the forecast period. US$ 2 Trillion mega project on Smart City along with relaxation in FDI will create good market prospects for industry players in the country. North America and Western Europe will follow next to Asia Pacific in terms of revenue. Unlike Asia Pacific, wherein the growth will be driven by construction sector, North America will create good revenue prospects from its non-construction sectors including flourishing automotive and consumer appliances sector. Global coil coatings market is substantially consolidated with top seven players accounting for over 55% share. Leading players are highly focused on enhancing their integrated vertical supply chain. This helps them to reduce overhead costs. 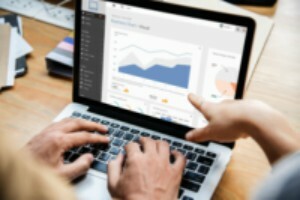 The Valspar Corporation, BASF SE, The Dow Chemical Company, and Akzo Nobel N.V. are few key players covered in the report. An in-depth analysis of the Coil Coatings market across regions – North America, Latin America, Western Europe, Central and Eastern Europe, Asia Pacific, Middle East, and Africa. How the Coil Coatings market sales is expected to grow throughout the forecast period. Purchasing of Coil Coatings market research report will give clients access to 120 minutes telephonic access with a research analyst. The duration for access to analysts will be based on the report subscription editions. To access the detailed Coil Coatings industry TOC and sample research pages, download sample.